Interested in learning how to meditate and improve your understanding of true love? Then you might want to join Oprah & Deepak in their second free 21-Day Meditation Challenge – Miraculous Relationships. It starts August 5th and is open to anyone worldwide. The interactive program promises to help you “embrace your true essence, expand your understanding of divine relationship, and experience unparalleled connection with the world around you” as you meditate and journal daily. It’s also supposed to help you with relationships, so that they go easily and effortlessly. Not only that, but meditation in general is a wonderful way to reduce stress, lower anxiety, clear your mind, and enhance your overall health and well being. Sounds great, right? In past Chopra meditation challenges, such as the November 2012 and March 2013 sessions, a variety of meditation styles are introduced, so it’s a great program for beginners, but also nice for regular practitioners who would like to focus on something new and inspiring. Another advantage of the program is that you can do the meditations when and where you want and listen to them on your tablet, computer, or mobile phone. Also, once you log into your account, you can use an on-line, personal journal to make notes. Hopefully, they will offer the same feature this time around, too. So, why not give it a try? 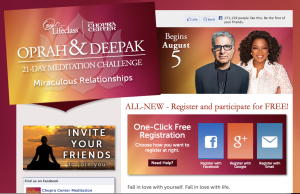 Go to the Chopra website to register via Facebook, Google, or email and enjoy the benefits! Let me know what you find the most inspiring or life-changing on your journey to miraculous relationships.